It's the time of year that every lady looks forward too and every man hates! At least that's how it is at the Dhanecha household! Just like the way, a car needs a service and MOT every few years, so does our house! 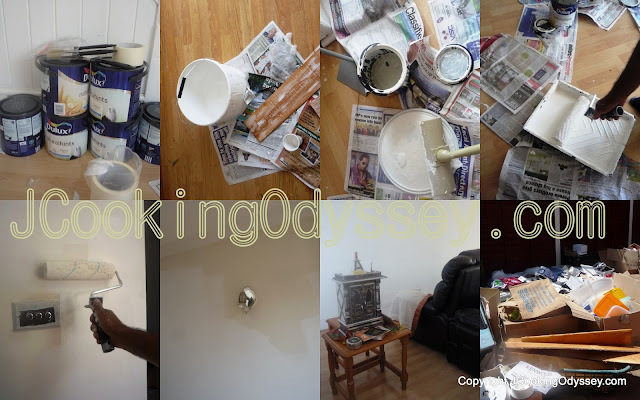 It's time to repaint and redecorate! Yay! Only my husband never seems to share the same enthusiasm! We've been running around from store to store picking up paints, equipment whilst trying to prep the house at the same time. In the UK, it's recommended that the whole house is repainted every three years. I try to always match this date as it keeps the house so much fresher! As we paint the house, it's almost like turning a new leaf. The house begins to sparkle more, feeding all of us a lot of positiveness. I love the fact that when you are moving everything around in your house, your guaranteed to find that box of old family photos! Refurbishing temporarily forgotten! The weather's definitely been on our side as this time, we didn't have to worry about the rain and could leave all of the furniture in the garden without having to worry. Unfortunately, this all comes at a price! It's physically taxing work and at the end of the day everyone is exhausted! But what better way to fuel yourself back up than with good old carbs!! My next recipe is packed with carbs like potato and pasta to keep the energy levels high up! This time, my daughter was able to help a lot. She helped with a bit of the cooking and helping pass the paint brushes back and forth! She made this dish for lunch and it was a tasty and filling treat! I'll definitely need this fabulous dish once again in few days as we haven't finished our work yet, still lot to do ! Boil the pasta in slightly salted water. After a few minutes, add the potatoes, then in another minute, add the green beans. The beans should have a slight bite once cooked. Toast the walnuts and then crush slightly. Add finely chopped garlic. Then add roughly chopped parsley and goats cheese and olive oil. Season and Mix well , keep aside ready pesto. Drain the pasta and stir the pesto through. 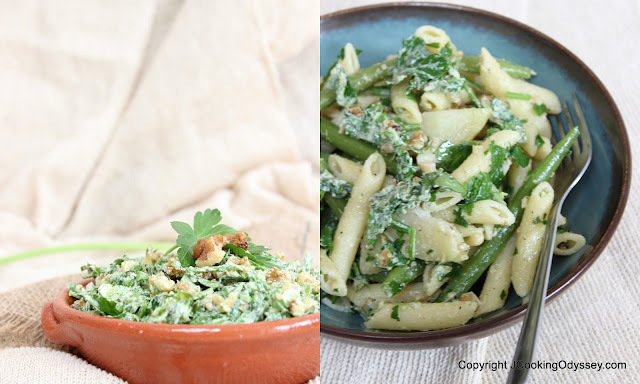 Love the use of green beans in this dish, Jagruti! The pesto sounds delicious, especially using the walnuts and goat cheese. Very appetizing! Looks awesome! Love pesto. Based on the age of these comments almost time for a 3rd house painting LOL.